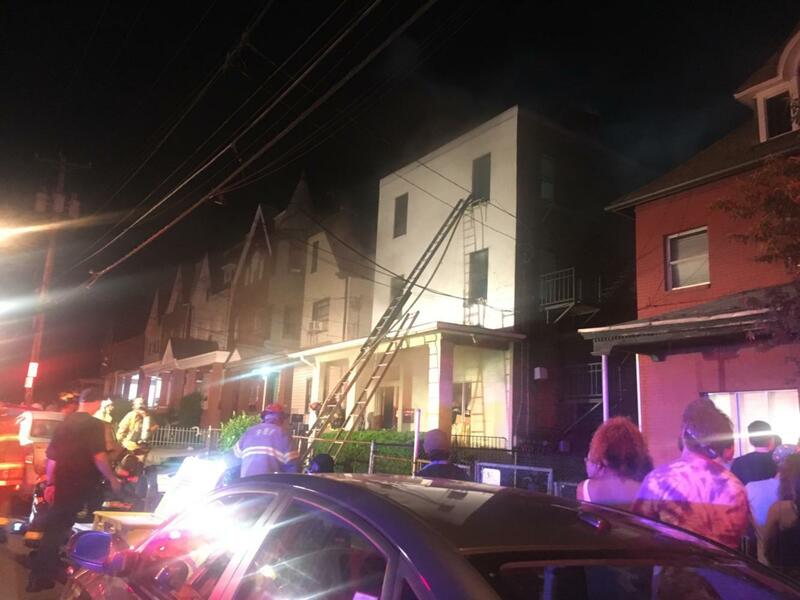 A three-alarm apartment fire struck an apartment building at 3315 Ward St. in South Oakland Sunday night around 10:30 p.m., sending two people to the hospital. According to Pitt spokesperson Kevin Zwick, neither victim is affiliated with the university. One victim is being treated at UPMC Presbyterian Hospital for burns and the other is being treated for smoke inhalation, according to Pittsburgh Police information officer Alicia Jones. Both victims are in stable condition. Pittsburgh Fire Chief Darryl Jones said the fire began around 10:28 p.m and the fire station received the first call at 10:36. The fire began in the basement, making it difficult for response teams to manage. According to Jones, the fire was contained to the basement and no neighboring properties were damaged. The rest of the building suffered severe smoke damage, and the cause of the fire is under investigation. Mike Medwed, a first-floor resident of 3315 Ward Street, watched as firefighters brought his property onto the front lawn. He’s lived in the building for 25 years. Another resident, a man in his 40s who works as a landscaper but refused to give his name, said he had a “weird feeling” that the emergency vehicles he saw when approaching his apartment around 10:45 were for his building. This story was updated May 21 at 10:50 a.m. It was first published May 20 at 11:42 p.m.